Looks Like I Just Paid For The AT Pro With This Honker! It's been a crazy week. Hot, cold, freezing, rain and snow. One day off in a 10 day stretch didn't help either. However, a little after work perseverance, some research and some luck got me some great finds! 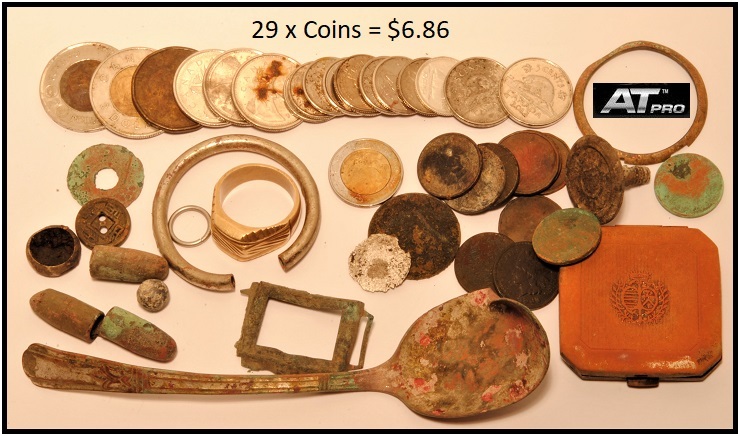 I knew that this area in Edmonton was old, and sure enough, out came these wonderful coins! 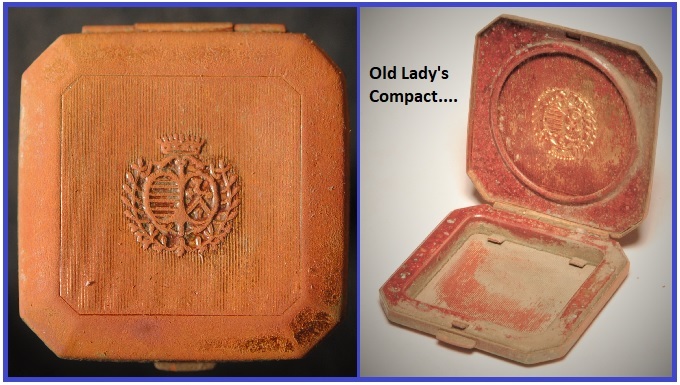 Included with these finds was this old ladies compact. It seems to have a bit of a British influence, as there is a crown in that logo stamp. There was a mirror in the top piece, but after carefully opening it up, all the broken pieces of glass fell out. And.....here's the find of the week! 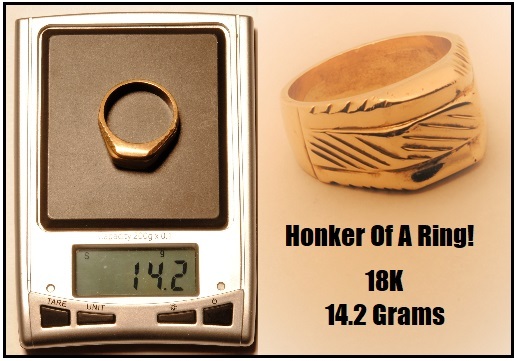 A large honker, 18K 14+ grams dug fresh out of the dirt. I just couldn't belie it's size and weight. At first I thought that it was maybe brass, but then saw an "18K" stamp on the inside. Woo-hoo! Friday was my only day off, and it was just a snow blizzard. 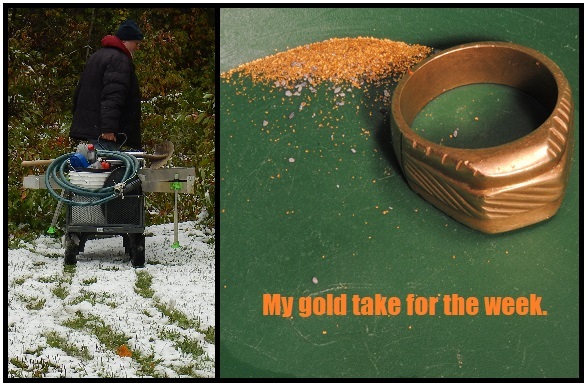 Still suffering from "honker gold" adrenaline, I went down to the river anyway, and shoveled gravel into my highbanker for nearly 4 hours. Here is the flour gold I got from that day. And......I usually dig other interesting items while shoveling gravel into my highbanker. 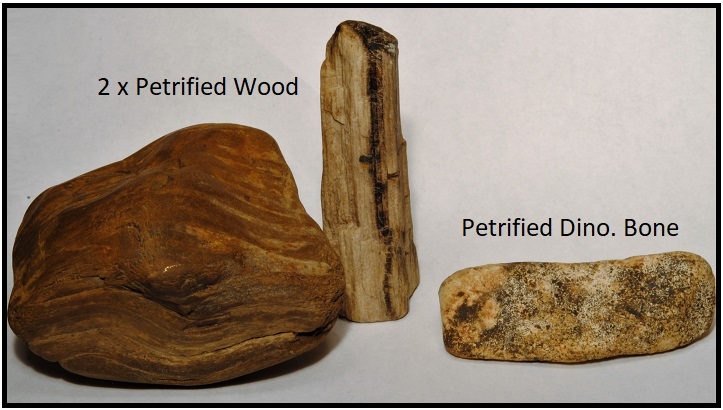 Here's a few pieces of more petrified wood and a piece of petrified dinosaur bone I dug. A few guys have gotten a dino too out of this river......I am still searching.